President Cyril Ramaphosa and President Brahim Ghali of the Saharawi Arab Democratic Republic (SADR) at the Union Buildings in Pretoria (file photo). 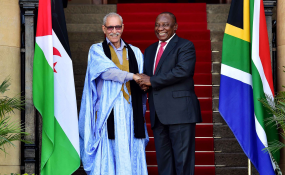 Algiers — In a joint statement issued at the conclusion of a working visit to Algeria by the South African Minister of Foreign Affairs and Cooperation. Ms. Lindyou Sisulu, the two countries emphasized the need to end colonialism in Western Sahara and allow the Saharawi people to exercise their right to self-determination. The declaration emphasizes that Morocco, after its admission to the AU, is obliged to respect the principles and objectives enshrined in the Constitutive Act of the Union.